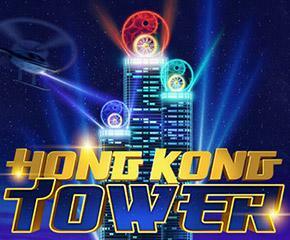 Hong Kong Tower slots is a five reels game based on the theme of futuristic view of sky-high towers. The slot is set in the backdrop of a majestic tower with blue lights everywhere. The view of the city from such a height just looks marvellous in the night time. You can even hear the sounds of buzzing traffic and cool winds. There is some sounds effect in the background when the reels spin. The game has preset betting strategies that you can activate anytime. These settings help you efficiently make a profit out of your winnings. There are 99 paylines that are active all the time. The betting starts with £0.20 and maximum is £100 each spin. ELK Studios gaming company is the developer of this fascinating Hong Kong themed slot game. They are also the creators behind many popular slot games played around the world. They create amazing graphics with impressive bonus features that make their game most preferred among gamblers. 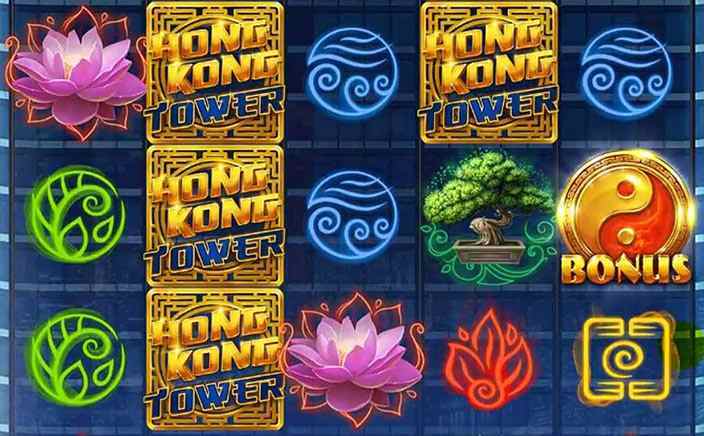 Hong Kong Tower slots is played with colourful and attractive symbols. The base symbols consist of bonsai trees, lotus flowers, diamonds and 7 in pure gold. The top payout symbol is 7 in gold that pays you 1500x your stake on five symbol landing. Chinese symbols in red, yellow, blue green and white are the low paying category. These give you a payout of 80x on five of a kind. There are three special symbols that activate bonus features in the game. They are red yin-yang, the game logo and blue yin-yang symbols. Mystery Feature: The game logo is the mystery symbol and it can reveal any base symbol when it appears in a winning combination. All the mystery symbols on the reels turn into the same symbol, thus increasing your winning value. Yin-Yang Bonus: The red yin-yang symbol is the scatter feature of Hong Kong Tower slots. When three or more of this kind appears anywhere on the reels, a bonus level is triggered. This level is also triggered by a blue yin-yang that is when revealed by the mystery symbol. Wheels of Sky: This is the bonus level where you have three rounds consisting of wheels with various multiplier numbers. The first wheel has a max win of 2000x, second has 10000x and final round has a stake win of 50000x. This is played by spinning the wheels and you progress to next level when it lands on arrow symbol. With plenty of bonus wins and stunning graphics, Hong Kong Tower slots offer the ultimate in slot gaming experience. The RTP of this slots game is 96.30%.